You’ve got to love those soul male duos – I certainly do. Erskin and Major Fuller made a series of fine sides on the West Coast in the 60s. 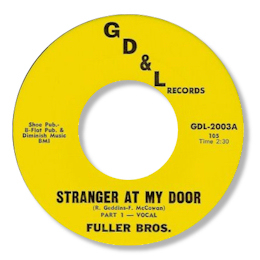 They started out recording for GD & L and the gently swaying “Stranger At My Door” has had admirers ever since. And not surprisingly as the interplay of the brothers voices over a Chi-Town sounding rhythm section worked very well. “Gee Whiz” didn’t quite have the same magic. I Want Her (By My Side) is an excellent piece of deep soul with both guys sounding really heartbroken. The backing arrangement is lovely with a big horn section supporting some fine piano and guitar, with the whole thing held together by a strong organ player. 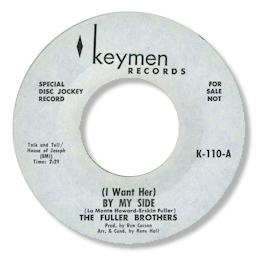 This is the original of a side also cut by Connie Tanzell – but as Mr Finewine has accurately commented – the lyric makes a lot more sense sung by the Fuller Brothers. Funky uptempo flip “Moaning Groaning and Crying” is good too. 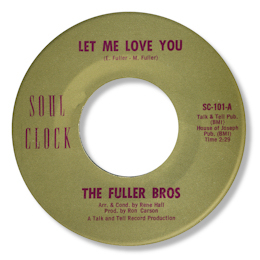 Both sides of their first 45 for Ron Carson’s Soul Clock sound as though they could even have been cut at the same sessions for the Keymen tracks. “Don’t Knock Me” follows the same ground as Moaning” covered. The other side though Let Me Love You is for me the second killer track that they cut. If anything their singing is even more impassioned than on “I Want Her (By My Side)”. Simply a gorgeous sound which should be much better known. The boys later recordings don’t quite do it for me, although the recut of “Stranger At My Door” has a very good groove, but the inclusion of a female chorus takes away a fair chunk of the charm of the first effort. Note ~ “Moaning groaning and crying” can be found on the Kent UK CD of the same name.